Image from Lindsey Letters here. We are in Indiana celebrating Thanksgiving with James’ family for the next couple days. This means snuggles with my fresh baby nephew, game nights where people yell a lot, Starbucks studying marathons with my brother in law who (thankfully) also has to work some over the break, and serious binging on all the tastiest foods. As in, there was homemade pie when we arrived at 11 last night. Like every other person these days, I’m counting my blessings, remembering what I have to be thankful for. 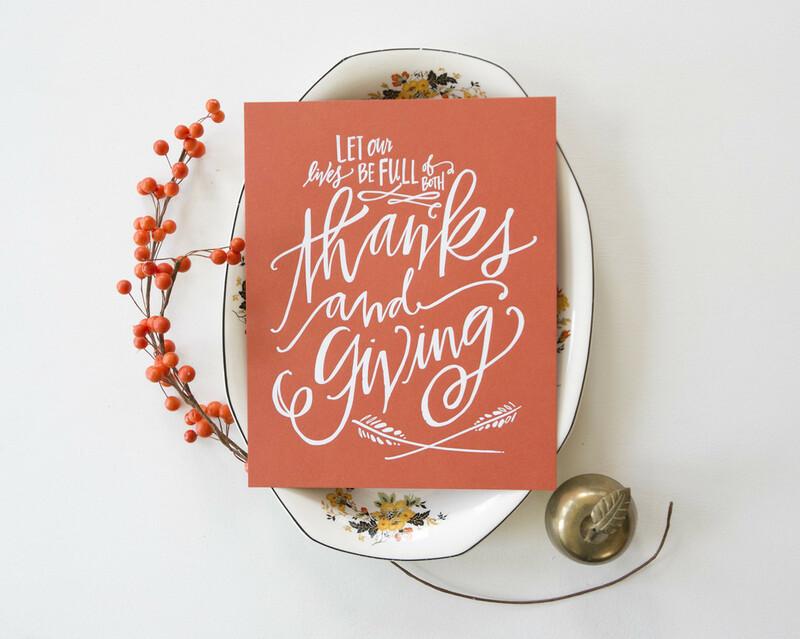 I love this print that I saw the other day because it reminds me of some of the things I am most thankful for from this past year are not just what has been given to me, but what I have been able to give. Here’s my short list. Family dinners on Thursday nights where I get to serve food to the people I love most in DC. Flannel sheets that we dug out for the first time of the season this past week. Trashy TV that allowed me to gather some girls in my living room once a week all summer and into the fall. Facetime and SnapChat and Instagram and all the ways that James and I could still glimpse each other’s lives when we were living apart. Sundays where our small group volunteers to clean up the nursery and I am humbled and reminded about the need for non-flashy service. Our church doesn’t have a building at the moment and while I would be thankful for one, I am constantly proud to be part of a congregation that models how to follow God when you don’t know where he’s leading. Peanut butter and apple slices. Donuts. Brunch. Big bowls of soup. Brie-bacon grilled cheese sandwiches. The foods that have flavored our year and kept us around the table. My elastic waist pants that allow me to be so thankful for the aforementioned bounty. A job I love, coworkers I enjoy, students I appreciate, and an office with the most precious and non-tacky Eiffel Tower lamp. Long walks around our neighborhood, even if the Capitol is covered in scaffolding till 2017. This entry was posted in Uncategorized and tagged i am thankful for, Thanksgiving. Bookmark the permalink. 2 Responses to Full lives. Happy Thanksgiving to you too Hannah! Happy Thanksgiving! Hope you have a lot of fun with the family and baby nephew.